This heirloom iris, ‘Flavescens’, was growing at my former 19th century farmhouse when we moved in. I had to dig it up and divide it to see what color flowers it had, as it was so crowded it didn’t bloom that first spring. It bloomed every year once I started caring for it, but rather sparsely. Oh, well, I thought to myself, it’s an old variety. What can you expect? After all, isn’t that one of the goals of breeding programs, to have more flowers on each plant? ‘Flavescens’ is going gang-busters this spring. I didn’t know she had it in her! It is doing so much better here, it makes me wonder what I was doing wrong at the old house. Maybe it didn’t get as much sun there. Or maybe this iris just likes my not-much-fuss garden bed preparation, which I had not perfected back in the early days of my gardening life. In September 2012, this gorgeous clump started out as a measly two fans. Who knew in two years these two fans would make such a spectacular clump? Now it looks smashing with true-blue perennial flax (Linum perenne), fragrant dianthus, and variegated dogwood (Cornus alba ‘Bailhalo’ Ivory Halo®). This old-timer iris looks great with variegated dogwood and perennial flax. I just can’t get over how great it looks this year and every time I come around the corner from the garage, my heart does a little leap. These front borders are finally coming into their own. 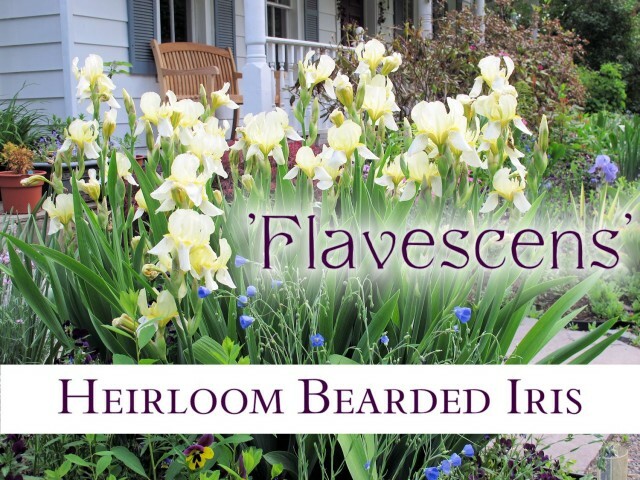 Old House Gardens and Restoring American Gardens list it as being introduced in 1813 as a cultivar of bearded iris. The Pacific Bulb Society calls it a hybrid, but they don’t say why they think that or which species it’s a hybrid of. Its origins seem to be shrouded in mystery. Of course it doesn’t affect how it performs in the garden, but I like to identify plants correctly when I write about them, and I was a little bit perplexed as to the correct nomenclature. See the bright yellow “beards” on this bearded iris? 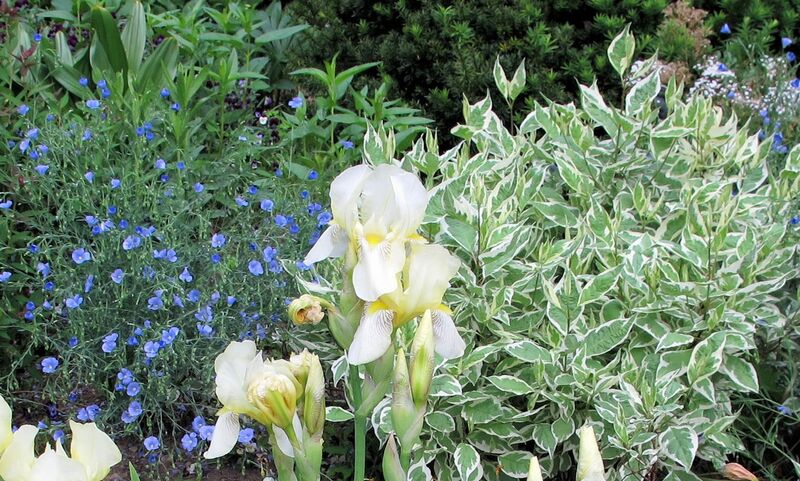 For more stories and photos about this heirloom iris, check out Old House Gardens newsletter archives. 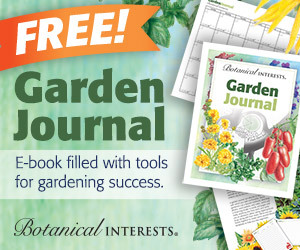 (You might want to subscribe to their newsletter, as it is always full of interesting tidbits about heirloom flowers.) And if you have other flowering bulbs that were growing at your old house when you moved in, or were handed down to you from older gardeners, you might want to take a look at the Pacific Bulb Society’s list of Legacy Bulbs. Those pictures are great, and the border has really come into its own. You did such a nice job mixing the colors and getting everything to work together. I bet it’s a pleasure to sit out on that bench and enjoy the sight…. you’ve earned it after last winter! I’m glad you like it. 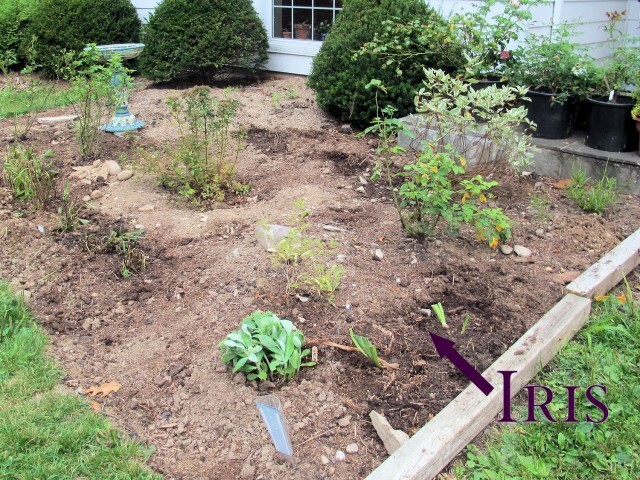 Sometimes I think it is a little too jumbled, but that’s far better than seeing bare dirt! 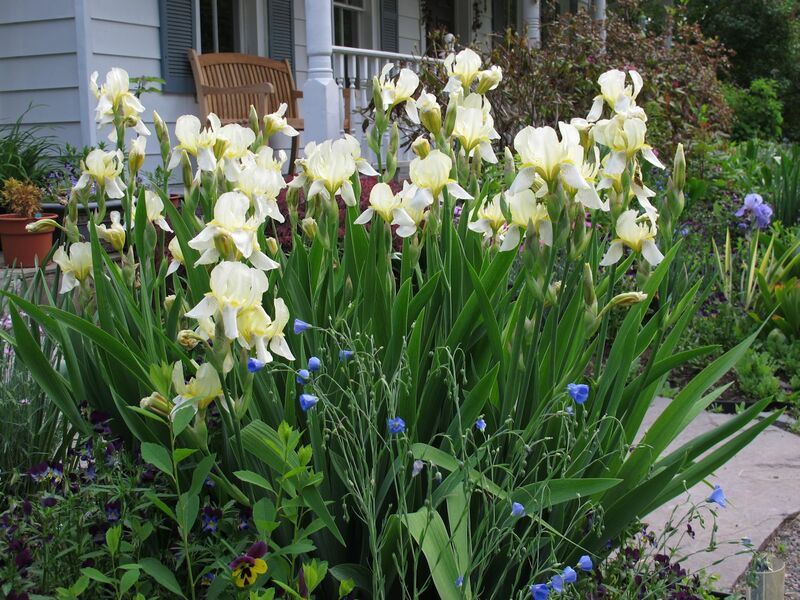 Iris are such a favorite for me, I always enjoy any information I can find…Great post, thank you. Oh Kathy be still my heart with that iris….I can see why you love it…stunning. It’s so interesting, how in some years a plant will be covered with blooms and the next have scarcely any. Like Donalyn @TheCreeksideCook, my irises and lilacs are spectacular this year, as were the crabapples. But the magnolia had very few blooms. 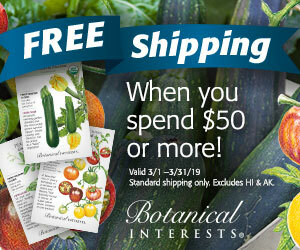 Since I live in Florida, cold climate gardening is not appropriate for me. I stumbled on your site & think that it is great. I love the color of your iris. I may have an heirloom iris in my garden too – not sure – it was given to me some 20 years ago by a woman I worked with at the time. She called it Kool Aid iris. It has the most wonderful Kool Aid scent. It’s blooming right now in my Johnson City area garden. It’s a lavender color. I’ll try to take a closeup and post it on my blog. I love the color of this iris – and it is so encouraging to see how quickly a new garden bed can start to come into its own. It seems to be a good year for iris, as it has been for lilacs – who would expect that they would do so well after the winter we had. On the other hand, my crab apple barely bloomed, and the same was true for the wild apples trees for the most part. And of all things to lose, it seems my jackmanii Clematis bit the dust. Arg. 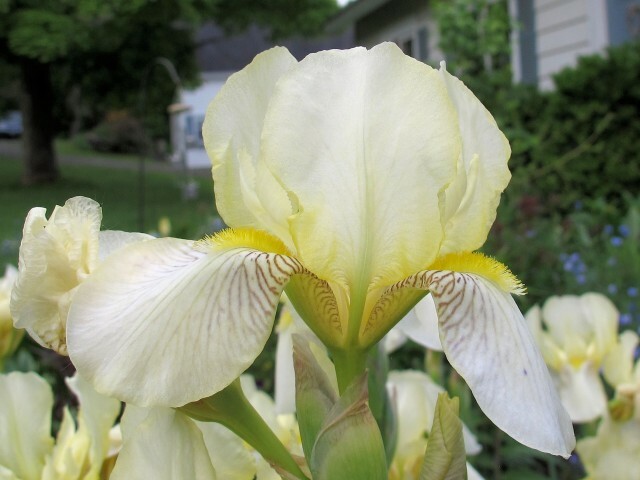 Love the buttery color of this iris – just beautiful! What a lovely iris and it looks lovely with the flax.